3.Note: Folding package, so when it arrives, you could make the tree perfect with an iron. Advantages：Our Christmas Felt Advent Calendar can help kids to learn the numbers, understand the concept of waiting for Christmas, learn about other countries traditions and embrace other cultures. It does not include unhealthy chocolates or any kind of sweets, decorative, safe and eco. Ideal for those who dislike chocolate calendars or don't want to be faffing about prising open tiny cardboard doors. ★ We Specialize in Providing Perfect Service for Party, such as Christmas, Birthday, Hawaii, St. Patrick's Day, and Easter Day. ★ Our adorable Christmas Advent Calendar is well made by safety felt material, this one is definitely a keepsake for kids and will last for years to come! ★ Chirstmas advent calendar is the cutest Xmas gift for kids, can be hanging on wall or door easily, adorable Christmas ornaments. ★ Unique Fun count-down tradition for kids and the entire family, perfect for children and adults in a winter holiday decorations, add some kid-friendly holiday cheer to your home. 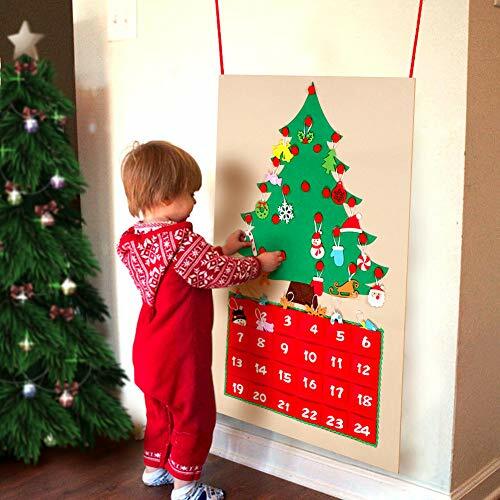 ★ 23 inch by 35 inch Felt Christmas Tree Advent Calendar is a fun way to help your kids Countdown To Christmas, became an important part of your Christmas traditions. ★ Aytai offers different ornaments of Christmas decoration, just kindly check Aytai store and sneak a peek at most popular Christmas décor.